Merry Christmas Eve, Eve :-)! I will be sharing several Christmas cards over the next few days that were created with the December 2016 ArtisticOutpost (AO) release stamp sets, Christmastime and Gloria (available at Our Daily Bread Designs). This card was designed using only the AO Christmastime background stamp and I am linking to the Mixed Media Monthly Challenge #31 "Merry & Bright" Challenge. 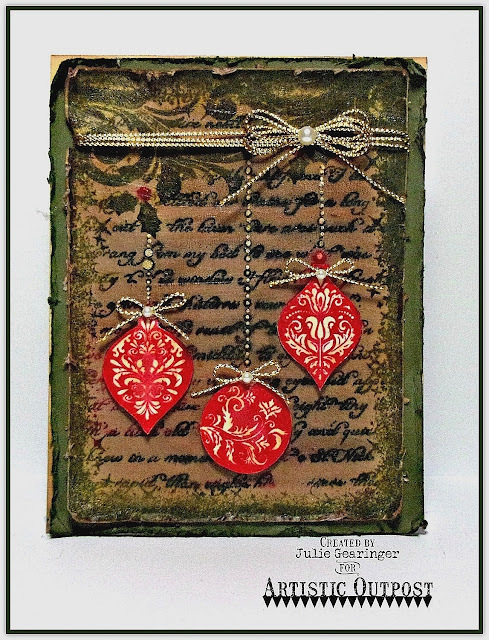 If you have not had a chance to visit The Artistic Outpost Blog or the linked challenge site yet, I encourage you to do so- gorgeous inspiration from my Design Team sisters on the AO Blog as well as the Mixed Media Monthly Challenge gallery! 1). Ink the AO Christmastime background stamp with various water-based markers, “huff” onto the ink to re-moisten before stamping onto a piece of vanilla cardstock. 2). Ink the ornaments only on the AO Christmastime background stamp with a red water-based marker, stamp onto a separate piece of vanilla cardstock and carefully cut out the ornaments (setting aside for now). 3). Using tea dye, vintage photo and walnut stain distress ink, carefully sponge the distrees inks onto the stamped AO Christmastime panel to “age” the paper. 3). Use a distressing tool to distress the edges and apply vintage distress collage medium over the entire panel. 4). Once the panel has dried, apply distress crazing medium over the entire stamped panel. 5). Distress the edges of a piece of artichoke cardstock, mount onto the vanilla card base and sponge vintage photo and tea dye distress inks over the edges to “antique” the paper. 6). Once the AO Christmastime panel has dried, add the cord cording and bow and mount the entire panel onto the card front. 7). Use an extra fine white paint pen to add highlights to the ornament strands. 8). Add the fussy-cut ornaments to the card front with dimensional foam, add gold bows along with pearls to finish off the card. Thanks again for taking the time to stop by- hugs to all of you and I hope you have a wonderful Christmas! Love this piece! Love the antiqued edges and the colors! Wonderful! Thank you so much for playing with us at The Mixed Media Monthly Challenge Blog! Pink Christmas with Christmastime and Gloria!